The City of St. Louis Planning Commission will decide on the adoption of the Downtown St. Louis Multimodal Plan at the planning commission meeting on December 5, 2018. This exciting plan is a blueprint for how to increase transportation options in Downtown St. Louis. Recommendations include both long- and short-term project ideas, as well as policy recommendations for how the City of St. Louis can foster a more vibrant Downtown where walking, biking and public transit are safe and accessible modes of transportation. 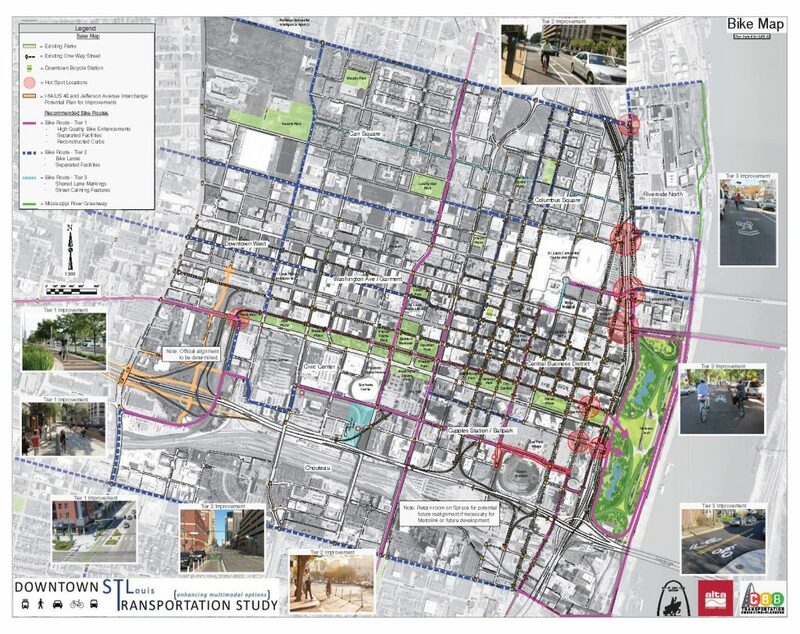 The driving force of the Multimodal Study is to better balance user needs in Downtown St. Louis and address significant impacts to traffic patterns in Downtown St. Louis as a result of recently completed transformative projects. The New Mississippi River Bridge opened in 2014, connecting Downtown St. Louis with Interstate 70 traffic, via Tucker, bringing visitors to the heart of Downtown. Additionally, the recently completed City+Arch+River project built a park over the highway, connected Downtown St. Louis with the Gateway Arch and the Mississippi Riverfront, and closed Memorial Drive providing direct access via interstate ramps. These significant projects have impacted transportation patterns within Downtown St. Louis. Additionally, the City has made substantial progress promoting active transportation by implementing new bicycle facilities, achieving the Silver Level Bicycle Friendly City Status, as designated by the League of American Bicyclists, and joining the National Association of City Transportation Officials (NACTO) as a large City affiliate member. While recent projects have upgraded connections to Downtown St. Louis, there remains a need to better connect users of all ages and abilities within our Downtown. Supporting a transportation system Downtown that provides economic prosperity for all St. Louis residents is a critical component to a thriving St. Louis region. This Downtown Multimodal plan better works to balance user needs, ensuring all St. Louis City residents have enhanced access to opportunity. Enhanced Transportation Options – The Downtown Multimodal Plan is committed to ensuring reliable transportation options exist for all St. Louis residents, regardless of age or ability. Enhanced transportation options are also crucial to the Downtown experience of tourists, employees, or other visitors to Downtown. A robust multimodal system ensures residents have reliable transportation options to get to work, school, resources, recreation, community goods and services, and many other amenities required daily. The multimodal plan for Downtown St. Louis promotes transportation equity and supports a resilient environment that is safe and accessible to all. 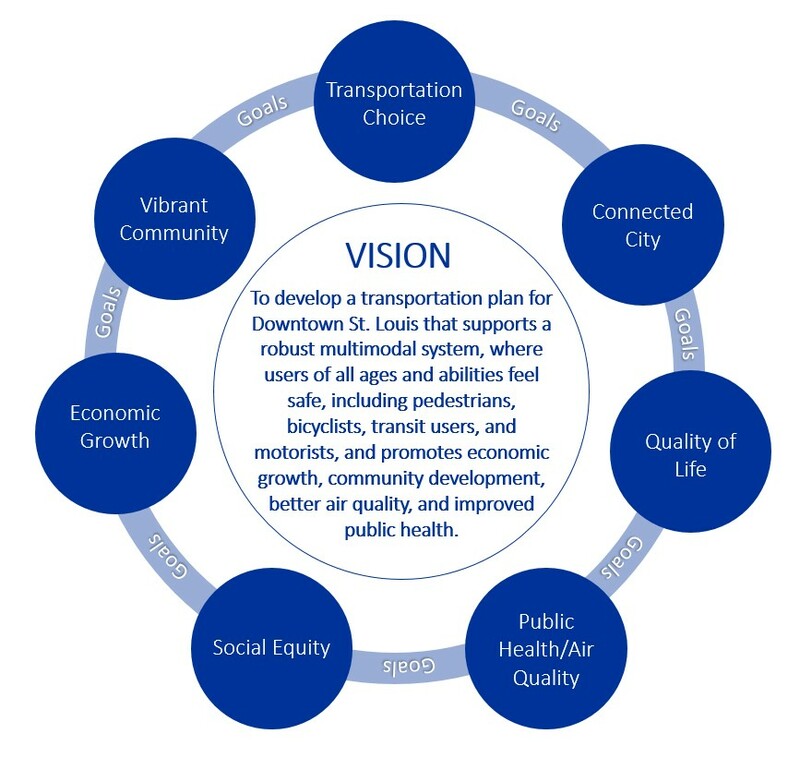 The plan develops recommendations for increasing bicycle, pedestrian and transit facilities, better connecting residents to goods and services while supporting transportation choice and mode shift. These recommendations have been developed in a way that accounts for all citizens, working to promote equity and resiliency within our transportation system. Walkable & Livable Downtown – Promoting a Downtown that is a vibrant Place is also a key component of this work. A vibrant Place is somewhere that you feel comfortable, a place where people belong and feel connected. A thriving, cultural Downtown with business and entertainment is the anchor for the entire St. Louis region. Streets represent nearly 70% of our public space and, thus, play a critical role in transforming the way residents within a community think about public spaces as a place. Streets that are safe for users of all ages and abilities promote active transportation, increased public health, and positive interactions within public spaces, increasing social capital and fostering a stronger sense of civic pride and engagement. 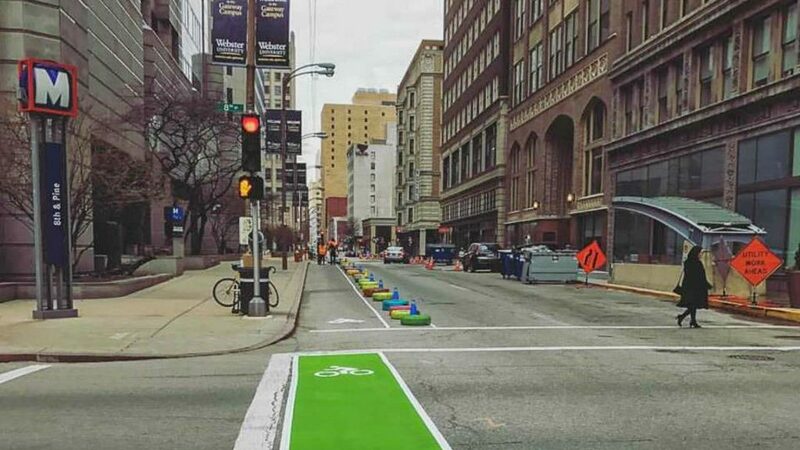 Strong pedestrian, bike and transit corridors can help bring a street to life and better connect St. Louis residents back to their City within these important public spaces. Transportation & Technology – Transportation technology is changing rapidly. These changes are some of the quickest changes to the transportation industry since nearly a century ago with the advent at the automobile. This invention shaped the way our streets were designed and influenced the way residents connect to goods and services. Knowing dramatic change can have profound impacts on the planning process, we must be prepared for these changes. Progress in automated and connected vehicles will start to be transformative to the way people both get around and connect to their City. The Downtown multimodal plan offers recommendations for how St. Louis can capture this exciting time. A Smart City better manages public assets and infrastructure decisions using data. Additionally, a Smart City is connected: connected in terms of how transportation systems talk to each other, but also connected in the sense that, using this new technology, residents are better connected to the goods and services they need regardless of age, ability, economic status, and many other factors that may affect opportunities to date. The goal of this document is to serve as a plan moving St. Louis forward toward achieving a City in which transportation choice is abundant. 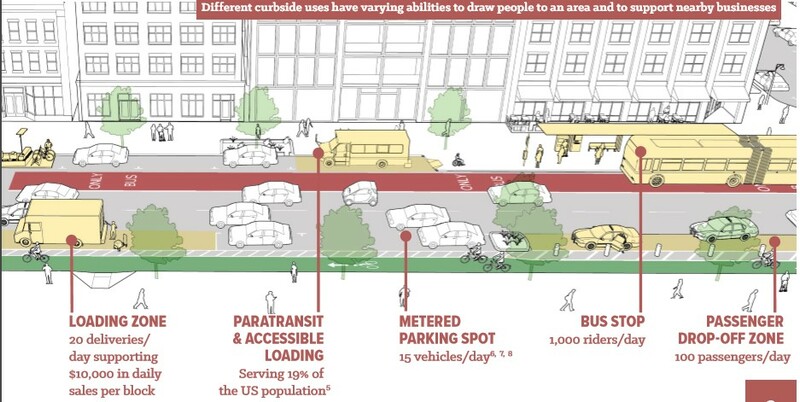 The multimodal plans envision a safe, lively, vibrant, and healthy downtown where users can interact with their neighbors in public spaces, safely reach goods and services walking or biking, and make informed transportation decisions about getting around. The major outcome of this work is the hierarchy of streets that was developed for Downtown. Because constraints exist in the public Right-of-Way (ROW), not every mode can be accommodated for on every road in a safe manner. This plan develops a network where safe facilities are proposed for users of all ages and abilities that consist of enhanced multimodal connections and circulation to move people where they need to go. Routes are prioritized for walking, biking, public transit and motor vehicle use. While this is not to say all modes cannot use all streets, it does help focus commute modes on certain corridors where specific upgrades will be included to add to the safety and comfort of the trip. For example, while all streets may include ADA compliant features and crossings, priority pedestrian corridors might have enhanced pedestrian scale wayfinding, unique public art, enhanced public spaces, increased pedestrian scale lighting, and many more features. Finally, the plan includes conceptual level drawings of new facilities at approximately 15 – 20 areas within Downtown. 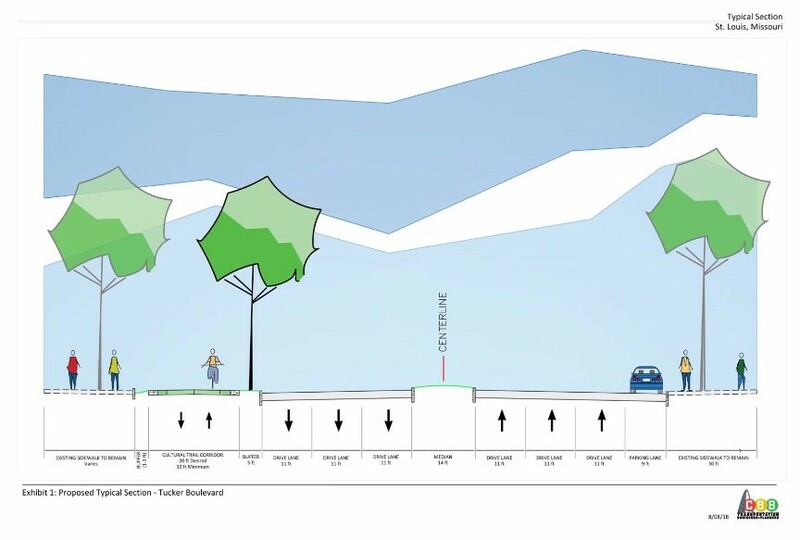 These routes show how streets might change, Tucker for example, with the addition of a protected urban bike trail facility installed. The full plan is available online for more detailed information about the project and outcomes. This is an exciting piece of work for the City of St. Louis that helps align transportation goals, and ensure our City plans a system that facilitates transportation options in a safe and accessible manner. Jacqueline Lumsden is a transportation planner at CBB Transportation Engineers. Jacque graduated with a Master’s of Urban Planning degree from the University of Kansas (Lawrence, Kansas) and served as the President for the Kansas Association of Planning Students.